RF Recording for the QS1R has been in the works for some time, and a few of us have (politely, I hope) queried the whereabouts of this critically important feature. While it is still not ready, Phil Covington has written a dll for use with Winrad, which appears to be quite useful. Winrad's latest version as of March 15, v. 1.42 build 49, supports QS1R without problems. 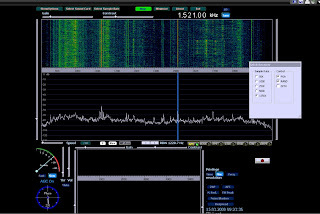 One can choose frequency spans from 50 to 1250 kHz, and RF recording is done by pressing the VCR-type recording button. The file saves by default to the winrad directory. The picture is a bit misleading since it was screen-dumped from a remote connection. Winrad tends to be rather graphic-intensive, so updating via remote is difficult. Hence, the bandwidth window is "empty". So, we can finally record RF from this excellent receiver! But I am hoping that the "real thing" isn't too far away.